The Midwest Clinic Board and staff had a wonderful time at our first conference in McCormick Place West. In the years to come, we are looking forward to collaborating with attendees to do even more in our new venue. As you may remember, we were eager to hear 2009 attendees’ thoughts and impressions after last December’s conference, and invited all of them – 15,208 people – to complete an anonymous survey rating everything from the overall program to the nitty-gritty details. We are very grateful to the almost 1,600 attendees who responded. They shared their experiences and insights, described their professional and emotional connections to the conference, and gave us practical ideas for the future. The survey revealed something very gratifying: overall, 2009 attendees were pleased with our core offerings – concerts, clinics, and exhibits – and the majority found that the new venue enhanced them. The survey also highlighted areas that should be improved. We are listening, and will spend this year working to strengthen every aspect of the conference. We think of the survey as part of an ongoing conversation, and hope you will continue it by reading the responses to key questions that follow. Please note that all questions were optional, so the results may not add up to 100%. How well did The 2009 Midwest Clinic meet your needs? Overall, what was the quality of the concerts at the Midwest Clinic? Overall, what do you think of the music programmed at The Midwest Clinic concerts? Were the concerts affected by the move to McCormick Place West? Overall, what was the quality of the clinics at The Midwest Clinic? Were the clinics affected by the move to McCormick Place West? How well were your needs met by the exhibits at The Midwest Clinic? Were the exhibits affected by the move to McCormick Place West? 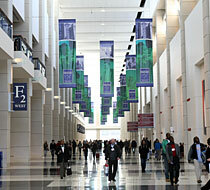 Please rate the general atmosphere of The Midwest Clinic in McCormick Place West. Please rate the dining options in McCormick Place West. If you used The Midwest Clinic shuttles, how would you rate the service? Please rate the 2009 event schedule. The Midwest Clinic is exploring ways to fully integrate events for orchestra directors into the conference. Several possibilities are being considered, including shortening the conference by one day and programming orchestra events throughout the rest of the week. Please rate this possibility. Please rate the overall value of The Midwest Clinic. Thanks to all who completed the survey! The Midwest Clinic truly appreciates attendees’ engagement and participation throughout the year.